To encourage HKBU academics to transfer their research and knowledge to the community, thereby producing wide-reaching and deep social impact, we have invited 4 distinguished colleagues from different Faculties / Schools to share their experiences in conducting Knowledge Transfer Partnership (KTP) projects. * Light lunch will be provided at all sharing sessions. 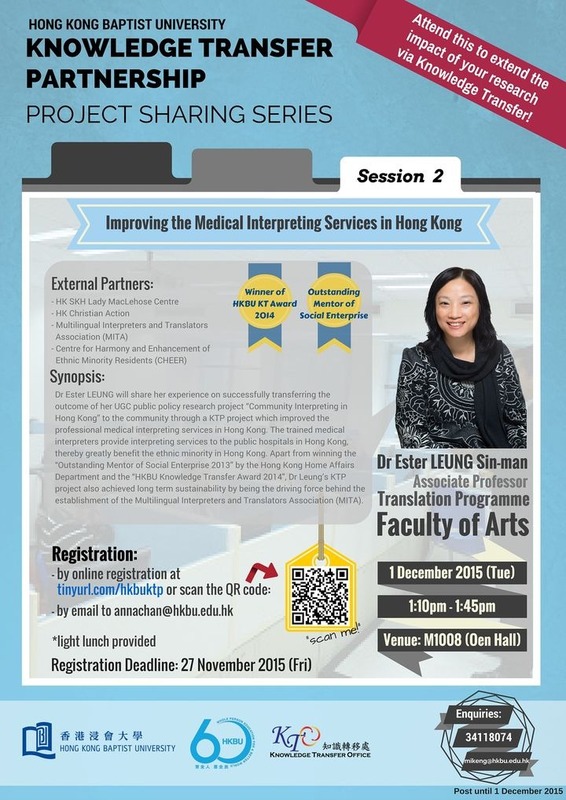 As seats are limited, please click here or email annachan@hkbu.edu.hk to register as soon as possible. Should you have any enquiries, please contact Dr Mike NG at 34118074 or Ms Anna CHAN at 34118003. We look forward to seeing you at the sharing sessions.